The big debut of “Solar Impulse 2” has arrived. 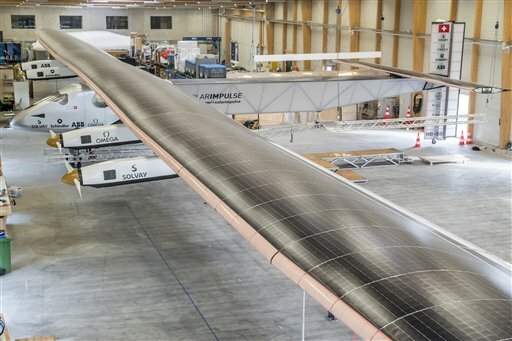 The aircraft – powered by 17,248 solar cells spread across its wings and body – is the successor of Solar Impulse, which flew across the U.S. last summer in about two months’ time. Bertrand Piccard and Andre Borschberg, Swiss pilots and co-founders of the project, unveiled their new aircraft today, a year ahead of their planned round-the-world flight, according to Agence France-Presse. Solar Impulse 2 is a bigger, better version of its predecessor, Borschberg told officials, reeling off the new aircraft’s statistics: The new plane has a wingspan of about 236 feet (72 meters), comparable to an Airbus A380. However, its weight is less than 1 percent of the jumbo jet, weighing in at about 5,070 pounds (2,300 kilos). The original weighs around 3,520 pounds and has a wingspan of a 747-400 jet. The goal for Solar Impulse 2 is to be able to fly for at least 120 hours non-stop around the globe, the pilots said. Last June, members of the U.S. Air Force had the opportunity to see the aircraft in person. Dr. Donald Erbschloe, Air Mobility Command chief scientist, and Col. Keith Boone, AMC Fuel Efficiency Division chief, headed out to Lambert-St Louis International Airport to check out the original Solar Impulse while it was in the area. The Air Force scientists met with Solar Impulse’s assistant flight director as part of the Department of Defense’s efficiency initiative to further lookout for innovative, cost-effective solutions to augment mission effectiveness. Over 70 companies have contributed their technologies to the Solar Impulse project. Solar Impulse began in 2003 with a 10-year budget of $112 million (90 million euros). It first took to the air in 2009. Check out more photos of Solar Impulse 2 here.